Early in the New Year Darren provided some reference photos of patients being fitted with appliances as well as a photo of himself to serve as the basis for a likeness in the cartoons. Chris set to work as the project seemed a good match with his style. A week later he had a set of roughs for Darren’s approval and by mid-January was ready to turn in the finished illustrations. They’re online now and do a good job of making what can be a stressful and anxiety-filled experience for patients look a lot more friendly and hassle-free. If you could use cartoons for promotional or advertising purposes and would like an idea of cost, please contact us. 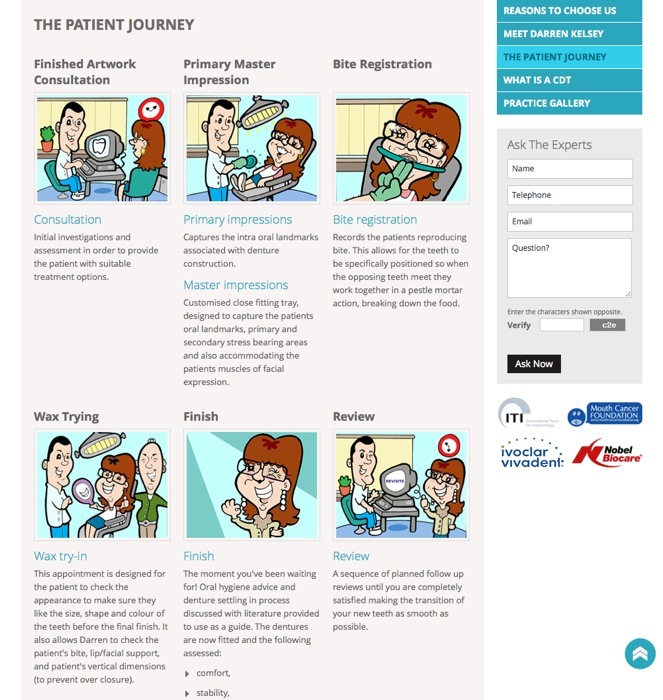 Cosmetic dentistry website, cartoon images illustrate the patient’s experience.